From the Beginning to "The War"
Late 20th Century and Beyond . 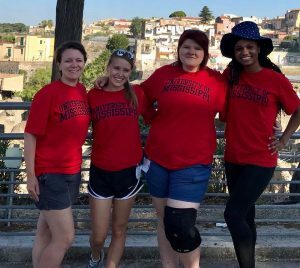 . .
Assistant professor of Classics Dr. Jacqueline DiBiasie Sammons and three UM undergrads, Arianna Kitchens, Madeleine McCracken, and Mweyeria Offord spent part of Summer 2018 hard at work locating and digitally documenting graffiti in the ancient city of Herculaneum. 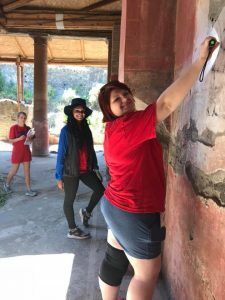 Dr. DiBiasie Sammons is the field director for the Ancient Graffiti Project and will be taking more students to continue the project’s work in Pompeii in Summer 2019. The Mike and Mary McDonnell Endowment for the Study of Classics helped fund all three students’ work on the project. Read more about Dr. BiBiasie Sammons and the Ancient Graffiti Project here. L to r: Dr. DiBiasie Sammons, Madeleine McCracken, Arianna Kitchens, Mweyeria Offord. The students at work in a Roman house in Herculaneum.